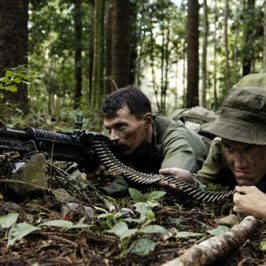 The story starts on the late afternoon of August 18 1966 when 108 troops from Delta Company, part of the 6th Royal Australian Regiment (6RAR) based in Phouc Tuy Province, headed into the jungle to investigate the origins of a vicious enemy mortar attack on the Australian Task Force base at Nui Dat the night before. Two hours later, the mainly inexperienced “D Company” (also known as “D Coy”) found that they were fighting for their lives, as they repelled an enemy force 25 times their number, in a treacherous environment – the middle of a rubber plantation called Long Tan. With little cover, torrential monsoonal rain, cut supply lines, ammunition running out, constant artillery bombardments and relentless enemy fire, the digger’s situation looked hopeless. However, against the odds, just as daylight began to fade, they succeeded in holding off their enemy. Eighteen Australian soldiers died at the scene: six from NSW, six from QLD, two from VIC, two from WA, one from SA and one from TAS. Enemy fatalities numbered between 500 and 800. For their actions, D Coy was awarded the prestigious US Presidential Unit Citation. The South Vietnamese allies also tried to provide the Australians with their highest military award. However, they were thwarted by the Australian government at the last minute and so the soldiers were given dolls, an action which has been debated over the years. The Battle of Long Tan reveals how the heroic deeds of the young Australian and New Zealand soldiers, guided by a perceptive band of commanders, rewrote the military manual. This unique story is told through dramatic scene recreations and exclusive interviews with the seven key Commanders from the Battle, as well as their soldiers, members of the former Vietnamese enemy and family members of those who lost their lives. 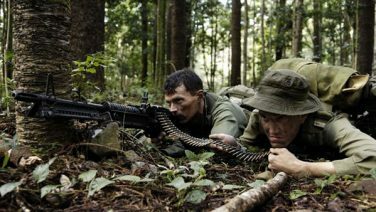 Investigate the battle of Long Tan, when an infantry company of untried Australians and New Zealanders held off repeated attacks by two heavily-armed North Vietnamese Army and Viet Cong units outnumbering them 20 to 1. For the Viet Cong, this was to be a master stroke – annihilate the soldiers of two nations thus forcing Australia and New Zealand to withdraw from Vietnam, embarrass the US, and influence the looming Manila peace talks. Masters of the annihilation ambush and with a much stronger force, the VC believed victory would take about 20 minutes. But in a grim firefight in monsoonal rain the Vietnamese were mauled badly, losing more than 500 men to D Company’s 18 KIA. What went wrong for the ‘invincible’ VC? To commemorate the 50th anniversary of the Battle of Long Tan, a special array of memorabilia has been produced in honour of the soldiers of 6RAR’s Delta Company. The collection of products includes lapel pins, limited edition coins, caps, jackets, mugs, stubby holders, friendship products and much more. Click to find out more. All profits from the sales of the products will be distributed to the Australian Vietnam Veterans Group (AVVRG) and Soldier On.